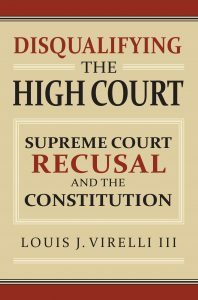 In a recent article in the Washington Post Supreme Court Justice Ruth Bader Ginsburg’s comments on the consequences of a Trump presidency are discussed by legal scholars, including Louis J. Virelli III, author of the recently published Disqualifying the High Court: Supreme Court Recusal and the Constitution. Professor Virelli discusses what might prove to be grounds for recusal if a Trump administration takes office next year. The Supreme Court’s recent decision in Williams v. Pennsylvania confirmed the close relationship between recusal and constitutional law. As I argue in my new book, Disqualifying the High Court: Supreme Court Recusal and the Constitution, recusal at the Highest Court must be treated exclusively as a matter of constitutional law in order to both properly protect litigants like Mr. Williams and to ensure that our most powerful courts are able to fully perform their public duties. This has important consequences for several hot button issues, including the ongoing disputes over whether certain Supreme Court Justices are fit to preside over politically controversial cases and Donald Trump’s accusations that Judge Gonzalo Curiel is unfit to participate in the ongoing fraud case against Trump University.